We continued our journey through the Muziris Heritage sites. We have already covered the Paravur Synagogue and Pallippuram fort. It was close to noon and was getting hotter each minute. It was a relief to get back to the air conditioned boat and travel over the calming waters of River Periyar. Our next destination is the Kodungallur Fort which is also known as the Kottappuram Fort. 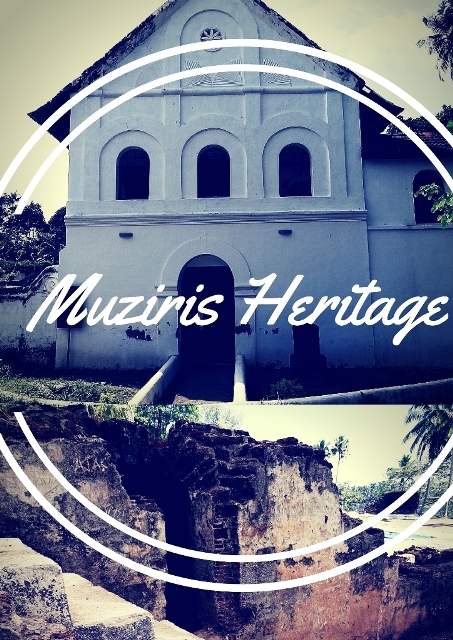 It is an important stop in the Muziris Heritage tour. As we approached the Kottappuram Jetty, we saw the famous Kottappuram Market on the left side. It is an ancient market place which came into existence during the Perumal reign of Kerala. Kottappuram market played a crucial role during the active times of the Muziris port and also hosted the Portuguese and Dutch traders during the 15th and 16th century. This market is aptly included in the Muziris Heritage Project. It is no less than a monument in itself. As we approached the “Kottappuram Jetty”, I could see the ruined wall of Kodungallur Fort. There was a large crowd hanging around the fort. It was quite queer that such a large number of people came to visit such a subtle monument. I was kind of happy to see them, feeling proud that even the local folk started admiring the historical value of the Muziris Heritage sites. However my joy was short-lived as I realized that all those people came for a marriage at a nearby house. Due to space constraints, they were just hanging around the fort! So we were left with no company and walked towards the deserted fort. It would take a while before the guide arrives, so we walked around the ruins of the Kodungallur fort. Even though it is called a Fort, there is not much left of it. There is only a part of a bastion that is still standing; reminding the glory of this majestic fort. In midst of the rubble and ruins, it is quite difficult to make any sense of the original structure of the fort. I decided that it is better to wait for the guide and meanwhile I started reading a very interesting book by M R Raghava Warrier. It is about the history of Kodungallur and Muziris. There is a detailed description about Kodungallur fort in the book. It is only after 30 years building the Pallippuram fort that the Portuguese procured the permission to build the Kodungallur(Kottappuram) fort. Their wait was not in vain as the location of the fort was in such a key position in the River side. Portuguese built the Kodungallur fort in such a way that most of its bastions protrude towards the water. It enabled them to closely watch all the boats that pass from the interior villages towards the sea. It was impossible for any movements in the water without being noticed by the patrol. The Kodungallur Fort was huge and strong which was built using stone and mud. It was protected by seven bastions, tall perimeter walls and a huge trench. However, the Portuguese couldn’t own the Kodungallur Fort for long time. In 1660, the Dutch general Ryklof van Goens tried to capture the Pallippuram Fort and Kodungallur Fort. The Dutch could capture the Pallippuram fort, however they faced severe counter attack by Portuguese at the Kodungallur Fort. However, after 2 years General van Goens again attacked the Kodungallur fort. This time he had the Zamorin of Calicut and King of Cranganore as Dutch ally. However the King of Cochin supported the Portuguese and send his nephew Godavarma and 400 Nair soldier for the assistance of Portuguese troops. The war between the Dutch and Portuguse ensued. There was a lot of bloodshed. A detailed description of this war is given by a dutch captain named Nieuhoff. According to him the war scene was so horrific - the dead bodies of the Nair soldiers floated all over the river and the entire river turned blood red. It was an extremely lucky day for us. Mithun – an archaeology expert who is a part of the Muziris excavation at Kottappuram was the guide we were waiting for. As he started explaining the history of Muziris and the Kottappuram Fort, our exhaustion was alleviated. We soon started exploring the fort with new found enthusiasm and meaning. After the war in 1662 Dutch conquered the Kottappuram fort. The first thing they did was to destroy the Portuguese fort to the last stone. The Dutch soon started building a greater fort on top of the ruins of the old Portuguese fort. So the remnants of the Fort that we see today at Kottappuram are actually that of the Dutch fort, not the Portuguese one. It was news for me. I was kind of proud that I had done my homework before coming to this fort, however I was humbled by the amount of history that was being unveiled . Mithun started explaining about the archaeological excavations at the Kodungallur fort. Before they started the excavations, this area looked like a hill. The Fort was completely buried under the sediments worth many centuries. It was even difficult to imagine such a fort existed at this place. The excavation team had to remove a huge amount of earth before they could uncover the fort. It was quite a challenging task, as one need to be extremely careful while digging lest they might damage some priceless historic artifacts. As they started the excavation, the walls of the Dutch fort started emerging. The research team found many Dutch artifacts including the wine pitchers as they started digging deep. When they went further down, they found the foundations of the older Portuguese fort. Mithun told us that the Dutch used some parts of the Portuguese foundation for their new fort. There is also a queer artifact on display at the Kottappuram Fort. It is the skeleton of a Portuguese man who was buried inside the fort. Detailed studies have revealed the burial would have happened sometime in the fourteenth century. It was with great enthusiasm that Mithun explained us about the excavations as part of the Muziris Heritage Project. However he did not fail to ensure that we were not getting bored as he kept on explaining about the smallest details of the fort. We assured him that this was the best ever history lecture we heard in our lives. Even though I have learned history in my school days, I have to admit that I used to doze off in the class. It is quite a different feeling, learning history as you see, touch and feel it. As we were about to leave the fort , Mithun mentioned about something that would evoke our interest. He told us about a piece of ancient porcelain vessel that he spotted in the fort a few days back. He asked if we are interested in seeing it. I jumped in at this great opportunity. After searching for 5 minutes we found a small piece of this vessel protruding out of the earth near a fort wall. We started carefully remove the earth and the ancient artifact started revealing itself in all its glory. It was my first ever archaeological excavation and I would never forget those precious moments of my life! The Dutch porcelain excavated ! We knew we cannot thank Mithun enough for his guidance which made our Muziris trip worthwhile. As we started our journey towards the next destination – The Kottayil Kovilakam, I had a last glance at the Kottappuram fort, which stands holding the memories of over 500 years. I wish more people start appreciating its historical value once the Muziris Heritage project gains popularity. We had a lovely lunch and a short rest at the restaurant near the Kottayil Kovilakam jetty. Kottayil Kovilakam was the headquarters of the “Villarvattom Swaroopam” – a local ruling family of the region. “Kovilakam” in Malayalam indicate a traditional ancestral house which usually has multiple stories and numerous rooms housing a huge joint family. Kottayil kovilakam region is the epitome of religious harmony as an ancient Krishna temple; a synagogue, a Christian church and a mosque co-exist within the radius of 1km. It was not a coincidence that various religious groups found a place in here. It was the wish of a broad minded ruler of “Villarvattom Swaroopam”. His Highness wanted all kinds of people from all religions should co-exist harmoniously in his land. I thought I would get to see a huge ancestral house at Kottayil Kovilakam, as name of this place suggests. However there is no “Kovilakam” to see here. The main attraction of the Kottayil Kovilakam is the Chendamangalam synagogue. This synagogue is located at a short distance from the boat jetty. Chendamangalam synagogue was founded in 1420 and later renovated in the 15th century. It is located at the farthest end of a small street which was known as the “Jewish street” in olden days. We walked quickly towards the Synagogue so as to escape from the blazing sun. In front of the Chendamangalam synagogue there is a stone tablet with Hebrew words on it. As we saw in the Paravur synagogue, It is not a historical description. It is the tombstone of “Sara Beth Israel” – a Jewish lady who said to be cremated in 1269. As the Jewish community migrated to Kerala, they brought this tomb stone along with them and installed in front of the Chendamangalam synagogue. She might be a very important person! We entered into the Synagogue. Unlike the Parvur synagogue, the Hekkal of Chendamangalam Synagogue is much colourful and ancient. The lower parts of the Hekkal is original from the days when the synagogue was built. However the top portions have undergone slight renovations. There are also huge chandeliers hanging from the roof of the synagogue. Most of them have become dull due to centuries of dust and usage. There was another group of foreign tourists inside the synagogue, among them only one knew English. Their guide is explaining about the synagogue to that lady who knew English and she was then translating to the entire group. It was such a lovely sight that people take so much interest and effort to understand the monuments in my country! Like the Paravur synagogue, the Chendamangalam synagogue also has two Bimahs. One is on the ground floor and other is on the first floor. The one on the first floor is supported by beautifully carved wooden pillars. This synagogue was built by wealthy Jewish business community and they said to have made it in resemblance of the temple of Solomon in mount Zion in Israel. We climbed onto the first floor of the synagogue. We could see the Melisha and Rabbanim in the first floor. In the first part of the Muziris heritage tour – I have described in detail about these parts of a traditional synagogue. Please read it here. As a part of the Muziris Heritage Project, this synagogue is set as a Jewish life style museum. The information panels inside the synagogue museum provide adequate information about Jewish lifestyle like food, language, ensembles, cultural and religious rituals. As you walk around the synagogue reading these information panels, you get a sense that you spend a day with a Jewish family. We exited the synagogue through the staircase on the first floor. Traditionally these stairs were used by women to enter directly into the first floor through the back side of the synagogue. In my account of the Muziris water tour to Paravur synagogue, I have mentioned about it. The street in front of the Synagogue is called the Jewish street. There are a few traditional Jewish houses on this street. However they look very similar to Kerala houses, except for the stone lamp in front of the house as well as the special slanting construction on the sides of the steps leading into the house. The Jews in Kerala had blended very well with the culture and lifestyle in Kerala. Even though they lived in constant hope of returning to Israel, they did not contempt the land which gave them refuge and shelter. Instead they lived to the fullest on this foreign land, enriching it’s culture. Most of the Jews have returned to Israel. However many of their descendants still visit these places to pay homage to their ancestors who lived and died on this land. I remember a guide telling me this – Many of them find it emotionally overwhelming to visit the Kerala synagogues as they remind them about their great grandparents. We walked our way uphill towards the Krishna temple which is located around 400 meters from the synagogue. Unfortunately the temple was closed as it was afternoon time. We had a distant view of this ancient temple and it was time for us to head towards the next destination. The next destination is Paliyam Kovilakam and Nalukettu. We walked briskly towards the Kottayil Kovilakam boat jetty.